Inspiration for do-it-yourself projects is born from using what you have to create what you need or want. At least that is how DIY shell clothespins came about at my house, and I love how they turned out. Everyday I think of another way to use them, and one of my readers commented she wanted to make some to give as a gift to a family member. So, here is how to make the super cute shell clothespins. In the heat of summer the sea calls with its pounding waves, seagull squeals, salty spray, and beaches cooled by swirling waters. 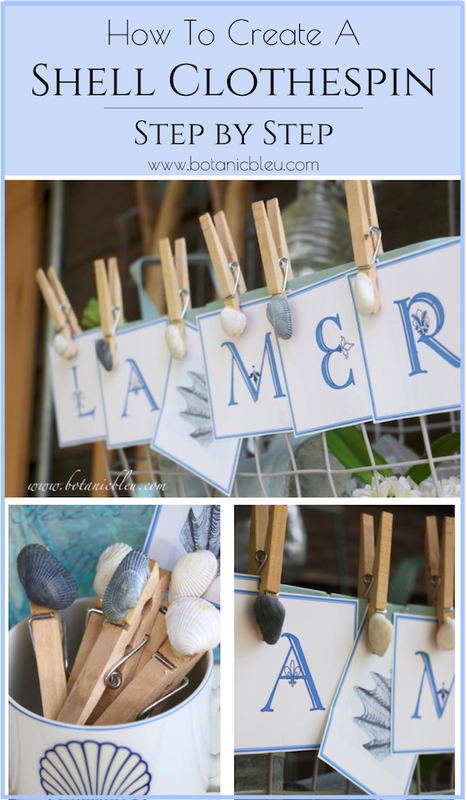 To capture the lure of the sea and to bring it home, display an easy to make DIY French coastal banner both inside and outside. La mer (the sea) will refresh your mind and imagination in the midst of summer's heat. 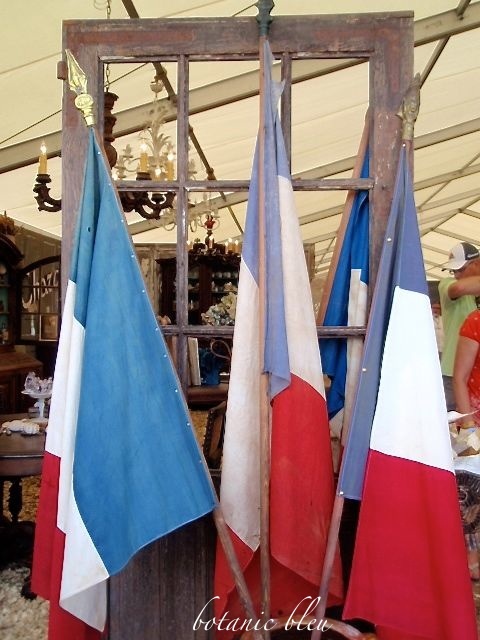 Collect books about France, white starfish, and a framed French postcard to create an inside vignette surrounding the French-themed coastal banner displayed on a photo stand. 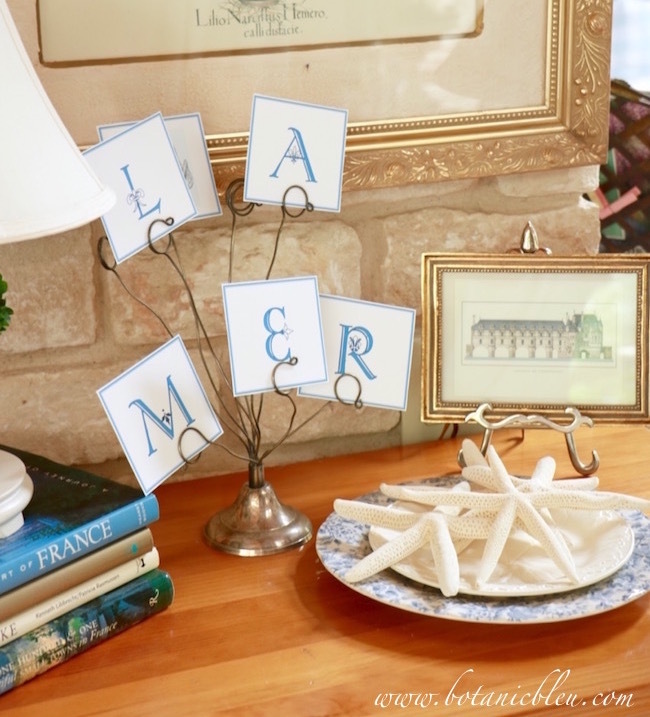 See a link at the end of the post for downloading a free set of blue and white La Mer letters decorated with fleur de lis. French design for national celebrations has much in common with national celebrations in the United States, beginning with hurrah for the red, white, and bleu that appears throughout celebrations in both countries. Both national flags sport red, white, and bleu, but the two bleus are not quite the same shade. The French flag is known as the Tricolore for its equal-sized bands of bleu, white, and red and was born out of the French Revolution in 1789 which was influenced by the American Revolution of 1776. Summer... the time for dreaming about the beach and countryside. 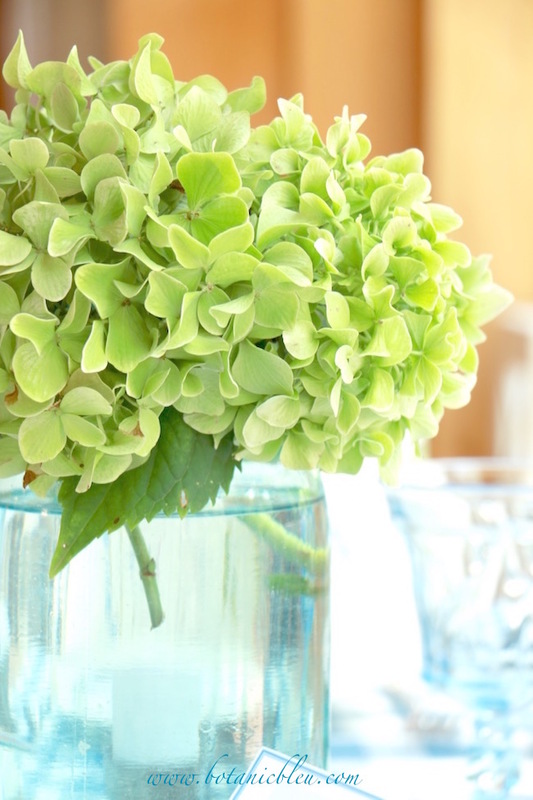 What better way to enjoy the best of summer from the coast AND countryside than to blend the two areas into a bright, cheerful table setting. The last time I looked at the stone shelf in the kitchen it had Valentines, and now summer has slipped past Independence Day moving toward summer vacations and beach time. 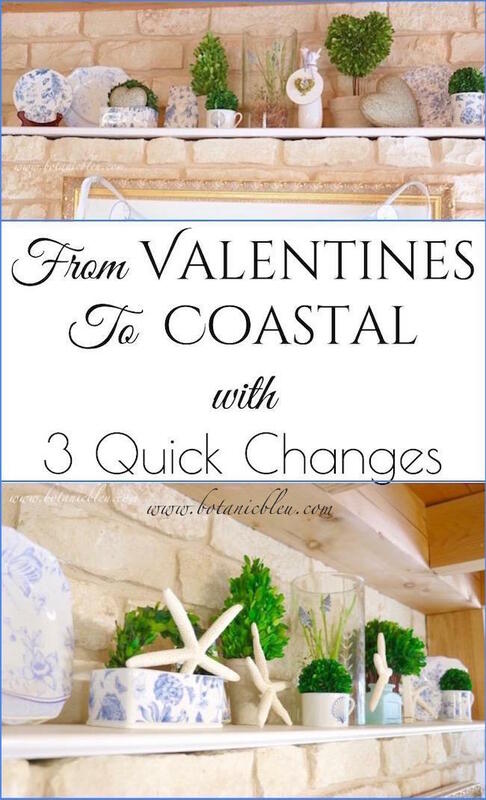 With just three quick changes, I updated the kitchen stone shelf from Valentines to coastal decor. Is any castle complete without at least one turret? French design for castles through the ages is replete with turrets used as guard towers. Later, turrets appeared in smaller non-royal residences, which were still spacious by today's standards. 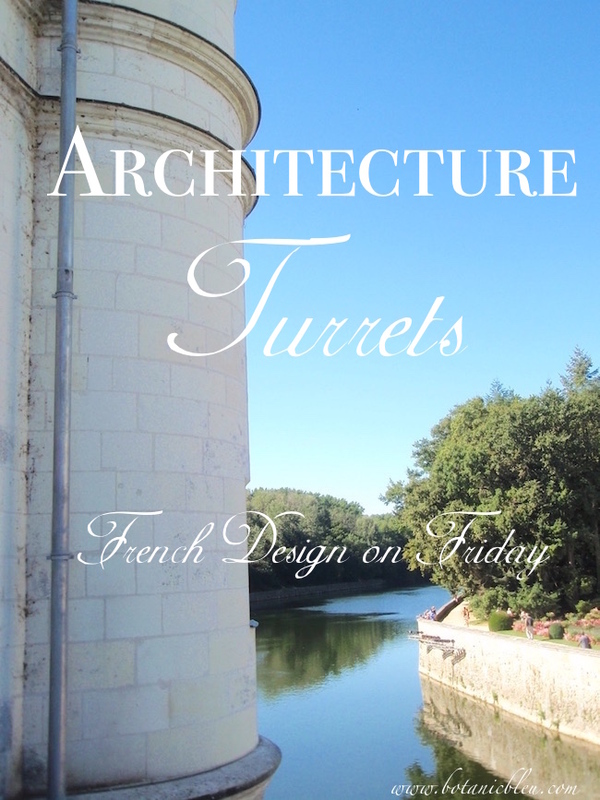 As late as Haussmann's rebirth of Paris as a modern city begun in 1853 and continued by others through 1927, turrets were still popular architectural features no longer used for security reasons. Chenonceau's main building has turrets at each corner, but the most beautiful turret is the detached ancient guard tower.